Preheat the oven to 180c. Grease and line a tin with baking parchment. Whisk the sugar and eggs together until pale and fluffy. Fold in the flour and baking powder with a rubber spatula. Once mixed, pour the cake mixture into the tin and use the spatula to smooth it down. Bake for 8 minutes. Place a fresh piece of baking parchment onto a worksurface or table. Remove the cake from the oven and tip it upside down out of the tin, directly onto the fresh paper. You can then carefully peel off the original piece of parchment from the cake. Trim any sides of the cake that are crispy or slightly overcooked. Then roll the cake up with the new parchment inside. Leave the cake to cool in that rolled up position. While the cake is cooling make the frosting by beating the butter until it is creamy. Add the icing sugar a little at a time and when it has reached your desired consistency, add the vanilla extract. Gently unroll the cake and spread the jam on top. 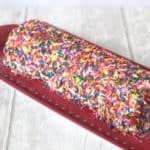 Carefully roll the cake back into shape and spread the frosting all over cake. Quickly add the sprinkles before the icing starts to harden.